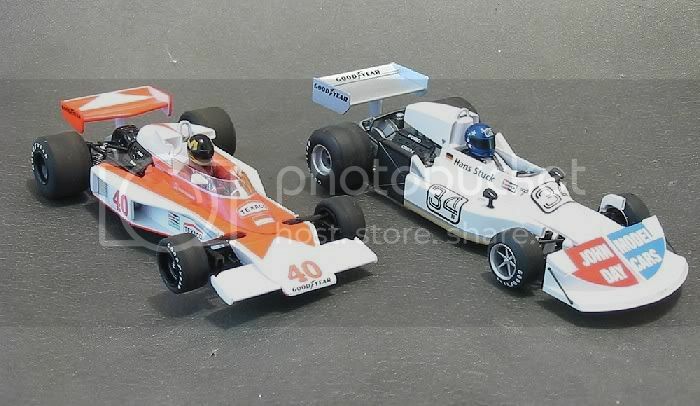 I bought the Scalextric McLaren M23 and Ferrari 312 Presentation pack some little while back and although I have inspected them inside and out, they haven’t been raced. This was intentional as the review revealed that both these models were an accident waiting to happen! Their construction has the emphasis placed on scale reproduction and the simplest way to incorporate as much detail into as fewer mouldings as possible. 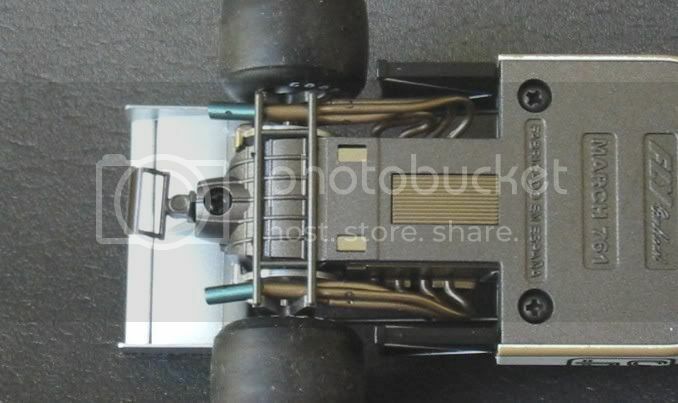 This still leaves the models as probably the most complex ones Scalextric have done to date! 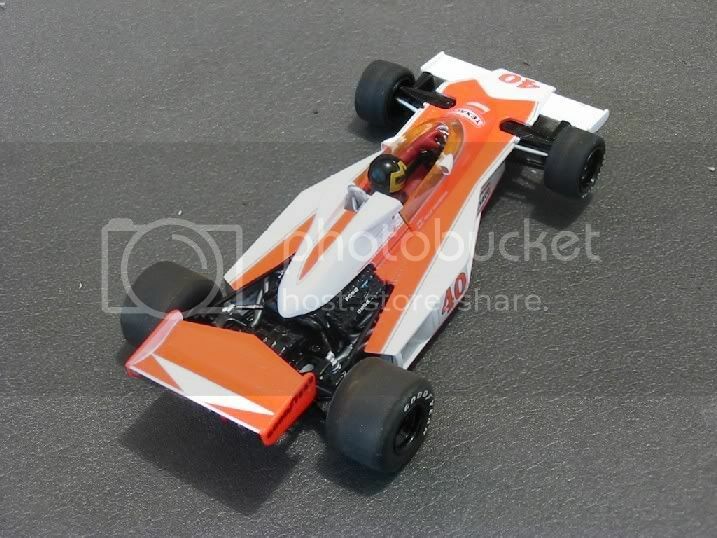 I have an MRRC McLaren M23 and the body detail consists of about four parts. 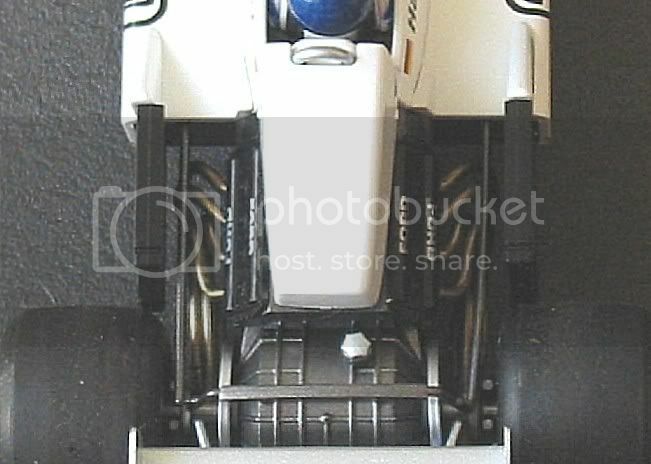 The Scalextric model consists of more than four parts in the cockpit detail alone! Removing the screws from under the body allows the model to disintegrate in you hands. Parts drop out and the full vulnerability of the model comes to light. The Ferrari 312 is worse and to race either of these on anything other than solo on a track full of sweepers and no barriers would be inviting disaster. 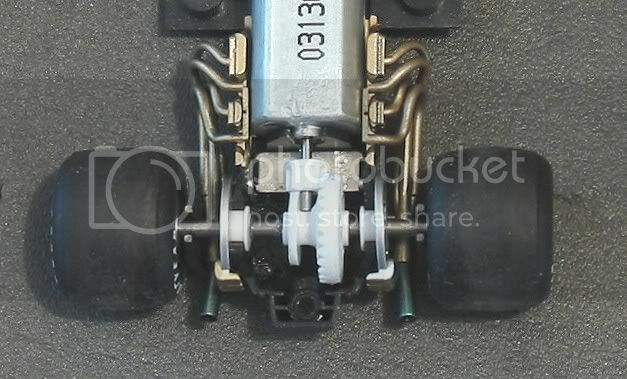 The front suspension detail comes as part of the front axle set and the underpan and as we know, Scalextric will sell you all the spares you want but not the bodies! 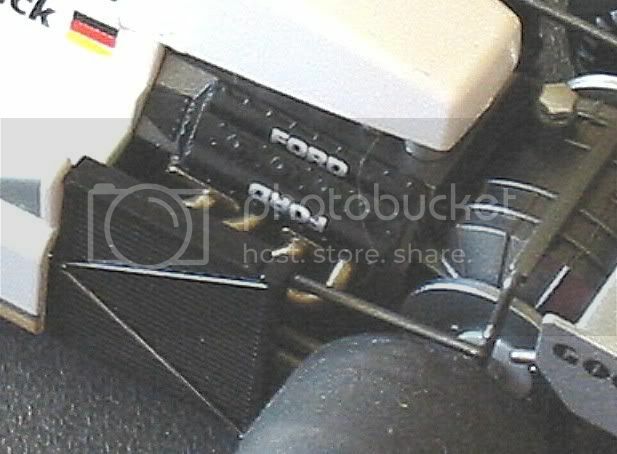 Note too that the front wing is detachable but is not listed as a spare part!! 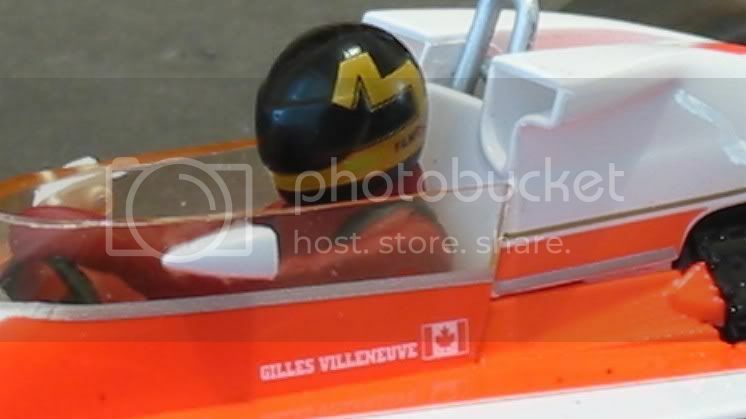 So the solution for me was to purchase the Villeneuve model recently released (as it has what appears to be the most sturdy front wing, which also comes as a spare) and run it only on reduced power on board tracks. Chicken?? Most definitely! 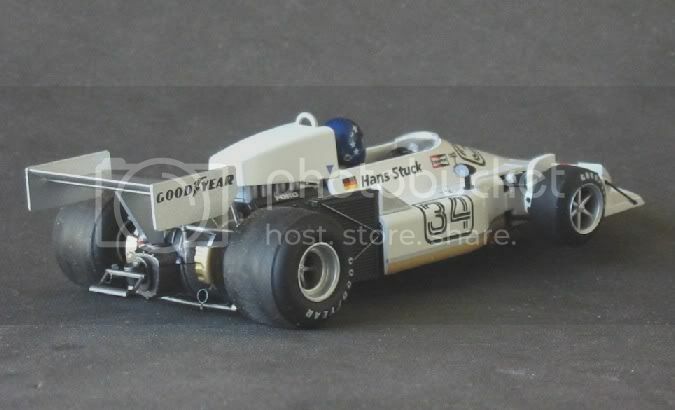 The purchase of this model wasn't driven by the need or desire to have a McLaren M23 for the track. I already have THREE! 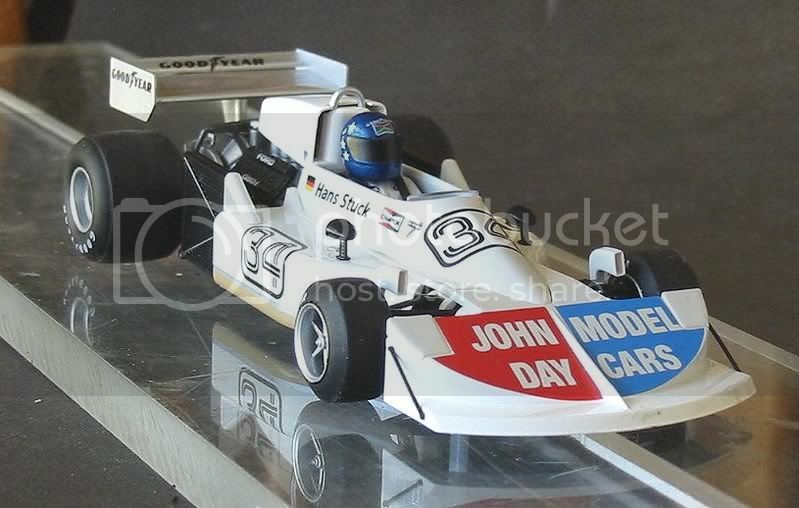 MRRC McLarens. One mint and boxed. One restored with the full compliment of original decals including the cigarette advertising, a new, bigger drivers head and ballasted for performance with its original Small Johnson '111' motor and the third one which is again a re detailed model but has the Scalextric 'S' can and a more comprehensive distribution of tuning ballast. So why the Scalextric model, this takes the number of M23’s to five??!! Well, I don’t really know. They have captured my attention and all going well, this should be the final model. But I suspect the motivation was the arrival of the Fly March 761 which is the other half of my story. 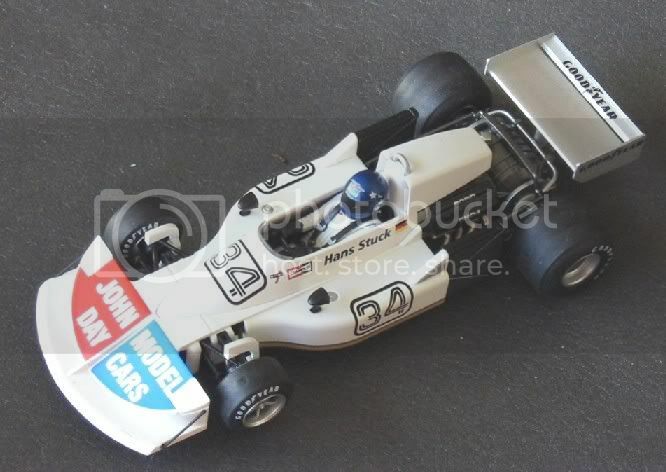 The March 771 (2-4-0) six wheeler has long been a cherished Scalextric model of mine and I have a restored one and another one that I converted to four wheel drive at the rear. These models again display the eccentricities in design from the seventies era. Models where manufacturers were still experimenting with wing and spoiler configurations, trying to glean the very last ounce of downforce from the atmosphere as they passed through it. 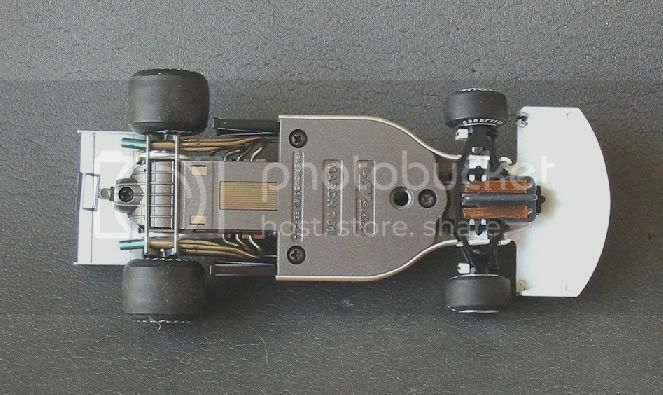 It has to be admitted that F1 models have changed externally much less dramatically over the last fifteen years than they did in any five year period before that! 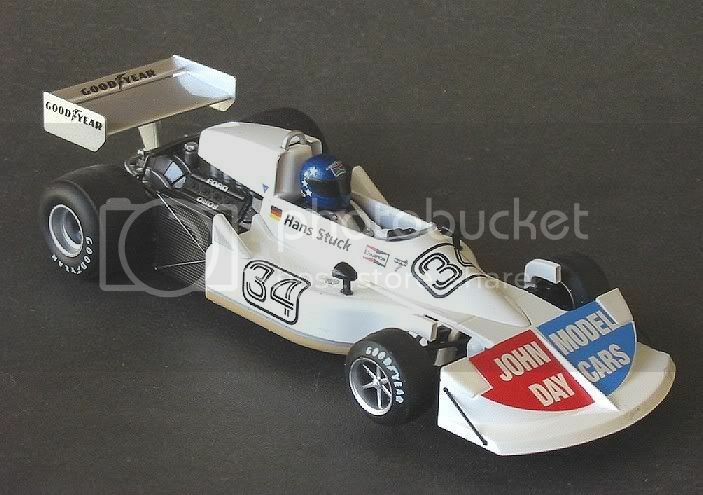 So, the Fly March was on the order book but being less inclined to purchase the presentation model at its presentation price, I opted for the good old ‘run of the mill’ Hans Stuck model that was released almost at the same time. This is almost identical and unlike some I saw no reason to split hairs. Both models sit directly in front of me know and as my typing finger gets more and more sore I can still only sit in awe of a pair of models which defy all the diecast rules and regs. The Fly car too was not meant to be raced? Well it was really, but I’m sure the pressure put on slotcar manufacturers from contributors on numerous slotcar forums left them in little doubt as to what we wanted, regardless! These two models are a case of 'catch up'. Those of us old enough will remember the MG Vanquish models of (almost) yesteryear! Check out my review in another part of the board. So, now I have them, it’s time for them to do what comes naturally and turn a few hot laps on my local Wooloowin board track. I decided it would be on a quieter evening than a full on race night so I arranged to meet good friend Lindsay at his place for a couple of hours research and slotting. The first operation was to get a few models around the track and clean the surface a bit and get the copper conductor strips working. They tend to get a slight degree of oxidisation when left to the elements for a short while. Three quarters of an hour later and after some close racing with JGTC's I took the opportunity to put these models to the test. First up was the Scaley McLaren. Out of the box it was a little bit skittish. By that I mean it needed a bit of attention to the braids and the guide seamed a little stiff. The tyres were way off the mark and moderate sanding was required to get the model to perform reasonably well and reduce the tendency for it to spin out on tight bends. The rubber compound wasn’t taking instantly to the track surface and although the tyres and wheels were quite concentric, it took some while and a good few laps to get it down to respectable lap times. Eventually, after treating the tyres with some CRC (WD40) it settled in and the laps started to come thick and fast. With a few mishaps to help me gauge maximum cornering speed, it wasn’t long before I was lapping within tenths of each lap. The final ‘best’ lap was 10.837 which, for a new model to the track and no fiddling, was a good lap. It takes a good seasoned model a while to reach these sorts of times but the overall lightness of the model and the pure grunt that the Mabuchi FF pours out were sufficient to get it there. The grunt may well have worked against it too! What do I mean?? Well, having a lot of grunt in a non magnet situation is not always a good thing. Give it a handful down the straight and more likely than not, the model will catapult itself in the general direction of travel but at the same time the front has lifted out of the slot and the whole kit and caboodle is heading for the scenery. This happened more than several times!! Fortunately, the nose zone is strong and providing the front wing isn’t caught by something immovable on the end then there is a good chance that you will survive this 'off'. Finally, a few modest laps interspersed with some hot ones saw the resulting lap time. A good model but as mentioned before, a trifle twitchy. Perhaps I should have dropped back to a 60 ohm controller? Next up was the March. Boy, I was looking forward to this!! I had already disassembled it at home and had a good old shufti at its vital parts. The steering / guide on this was stiff too, but for another reason. The steering is quite ingenious but delicate to say the least. Rather than having swivels every where, Fly have opted to use the natural elasticity in plastic as a source of movement transfer. This also operates as a self centring mechanism and as the guide turns, movement is transferred along the track rods via some very ‘mini’ swivels to the front hubs. These in turn are pivoted on the top and bottom ‘A’ frames and the wheel is fixed through the hub centre. Detail has not been spared and the overhead front brake air scoops are mounted to the hubs and the disc detail is well modelled behind the six spoked wheel. 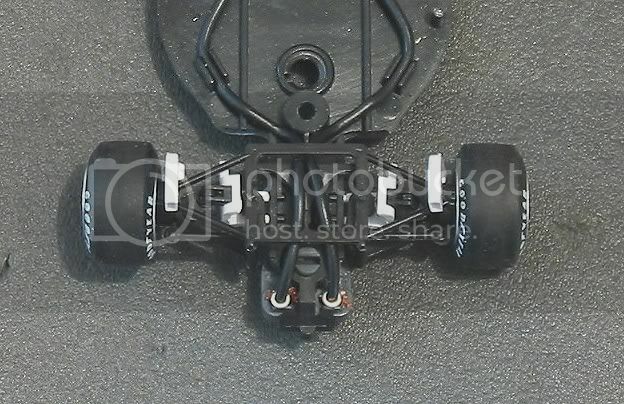 As well as steering, the model has some intricate front and rear suspension detail. The front steering unit is located in the chassis via a central front to back rod which allows the steering to rock from side to side. On top of this Fly have reproduced the front springs which, along with a bit of front end flex, allows the front end to rock inside the spring travel parameters. The guide stays upright too as most early attempts at steering have seen the guide shoe tilt with the axle. Good or bad? Not sure on this one. The entire front end is a little loose but the complexity of the modelling and the achieved working detail mark Fly up five points in my estimations. The separate rotation of the front wheels and the steering will minimise front end drag in corners often associated with fixed axle models and enhance the model's corner exit speed. On looking closely the rear suspension detail and especially the exhaust are almost perfectly modelled at the rear. A pair of radiators covers a lot of the detail but Fly have gone to extra lengths to depict everything. Torsion bars, tie bars and anti roll bars are all there in the finest of detail. 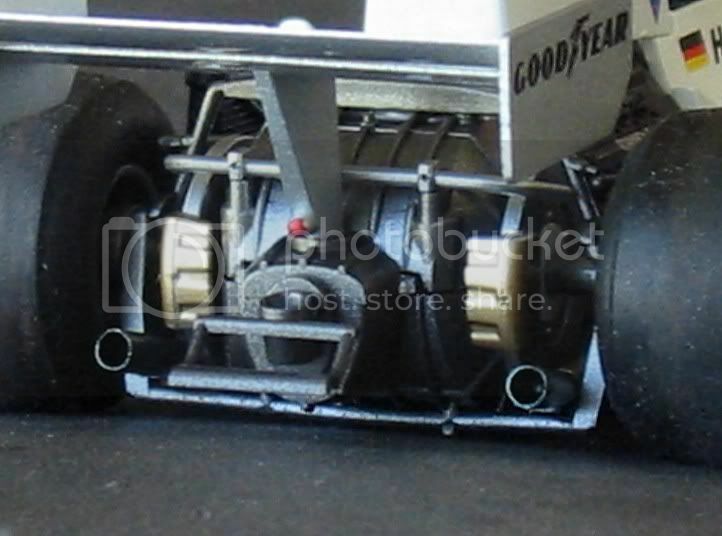 The inboard discs complete with callipers are excellent and as if it was necessary, they have reproduced the Goodyear logo on the inside of the wheels too! Only the diff housing has been exaggerated to accommodate the very real and very present crown wheel. 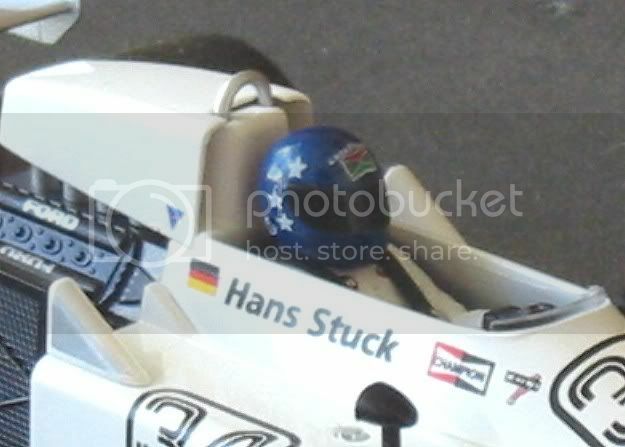 Lastly, the driver, Mr Stuck himself, looks very at home in all his detail. No half driver here. The full sized thing in all his glory. I am tempted to give this model 9.5 out of ten here and now but pragmatism tells me there is a track run to be done yet! On the track I pushed off moderately and was pleasantly surprised that, although this model also has an FF Mabuchi motor, it didn’t burst into life as did the McLaren. Driving quite moderately the model was a lot more predictable and also a bit taily but there was no violent acceleration making corners difficult to get out of? One reason was apparent when I pulled up after about ten laps. The rear tyres are ballooned a bit and the model was only running on the centre two or three millimetres of tread area. A Light sanding took the contact area out to about half and off it went again. Different, very different. Still more controllable and none of the screaming gears of the McLaren but still quick, and quiet. Cornering was a pleasure. Half gas once in the bends saw the model poke its tail out a little and navigate the corners with total predictability!! Helped by the tyres but more attributable to the better response to the Parma 45 ohm controller. I pushed on and picked up pace until I was at a comfortable limit. No ragged edge stuff, just one steady hot lap after another. Eventually I looked up at the computer and the fastest lap was 10.338 secs. Now that is a good lap which probably only five percent of my models will do!! A sub ten on this circuit is a blue moon affair! I was taken aback with the smoothness and drivability of this model on non magnet painted board. I was disinclined to return it to the track for an ultimate hot lap as the model, with all its detail, would almost certainly have suffered casualty in a soul destroying way. The front wing / nose cone is large but is totally devoid of substance and while it may offer some kind of protection to the steering and suspension I felt that it would quickly become a statistic I wasn’t looking for. Back on the track, friend Lindsay had got his Limited edition March out and I decided to see if I could match it in the McLaren so Mr Villeneuve was placed back on the track and after some tyre sanding we were on our way. Truly not quite as quick as the March 'out of the box' but this, I feel, is more attributable to the tyres than anything else. The March’s tyres just seemed to work better and have the edge in the corners. Then disaster, well, mild disaster, anyway!! The M23 stopped absolutely stone dead. Not a spark or a dickie bird from it. The track was tested and that was fine. I tried bump starting it for a couple of times but that was useless, now what. Do I need to dismantle this model, fresh from the box? Obviously so!! Mr Scalextric had decided that I should become one of his rare victims. In the old days it was wheels. You'd be racing round the track and then be overtaken by one of your own wheels, but this wasn't wheels. It was a screwdriver job. At home the following evening I decided to split the model and see what had happened. It didn’t take long to find out. The model fell apart, as they do, and there, for all the world to see (well, me, anyway) was a lead wire adrift?? Surely this is not true. A bad soldered joint? A poor crimp? Surely not! ‘Surely not’ was right! What had happened was the crimped end of the little plated strip which sits in the guide (one of two) and makes contact with the braids had broken off. Bugger! And it looked to be a fiddley soldering job if that was to be the fix. Oh hell! Mr Scalex, you did me good and proper this time! Why couldn’t it have been a loose wheel? I can fix those! This was obviously the result of maybe a trapped lead wire with the resulting stiff guide I had noticed at the start. A lesson learnt here and from now on, any Scaley model with a stiff guide (round type) should have the chassis removed and the wires checked. Anyhow. To shorten a long story, an email to my ‘on the ball’ Scalextric dealer told me that they came in packets of ten and he’d pop one in the post. But prior to the enquiry, I was about to temporarily screw the model back together when I noticed some white plastic around a front body screw thread. Sure enough, one of the screws that pass through the chassis and through the front wing into the upper body had brought all its thread with it when I took it out. Nice one Mr Scaley!! No doubt some over enthusiastic assembler on the production line gave this model one more for luck! Fortunately there is another screw in besides it. This is going to have to do the work of two from now on! So, back to the testing. What do I think? Well, both models are good and out of the box they are both good runners. The March took to the track more easily than the McLaren but that can be sorted. The McLaren is very revvy and twitchy but that too can be sorted. The Fly takes line honours for finish and detail but before the March, the McLaren was one of the best detailed F1’s . The McLaren is prone to hopping out of the slot on full acceleration, another fixable problem. The Fly is well mannered straight from the box. I have to give the McLaren eight out of ten for detail, seven out of ten for SOOB drivability and six out of ten for construction faults. The March I give nine and a half out of ten for detail, nine out of ten for drivability SOOB and nine out of ten for construction faults. I won’t add them up, I’ll leave that for you to do but the end result speaks heaps for the March. The McLaren is still a great car, no mistake, but for this once in recent times, Fly have the edge over Scalextric. Nice work Mr Fly. Now get your prices sorted!